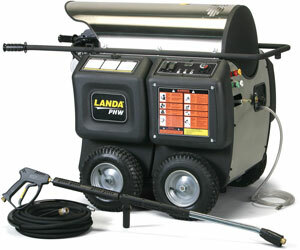 For nearly three decades, the PHW has been the flagship of the LANDA hot water pressure washer line. The PHW is heated by diesel or fuel oil using a high-efficiency burner. Industrial-Strength Electric Motor with multiple voltage options and thermal overload protection. Rugged tri-plunger, high-pressure Landa Pump with U-seals for longer life in harsh conditions comes with 7-year warranty. Attractive brushed stainless steel Coil Top Wrap provides a lifetime of rust-free protection.